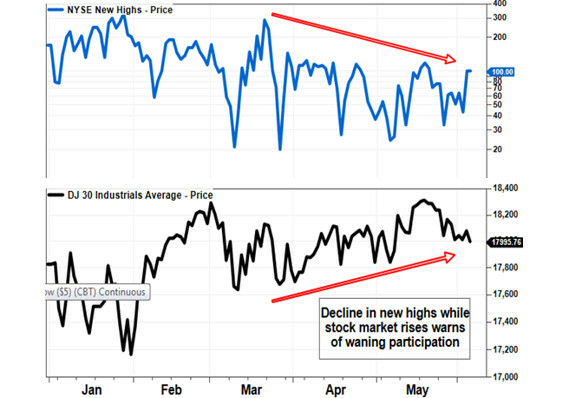 Since February, the Dow industrial Averages have been trading between a narrow trading range of 18,300 and 17,700. Does this SIDEWAYS TREND mean that the Dow is no longer a bull market? Is this what stock market chartists call DISTRIBUTION??? Although the NASDAQ has made new highs, the Dow Transports and Dow Utilities are definitely in a downtrend. According to the Dow Theory, this is a sell signal. If you want to know what’s really going on in the US markets, take a look at the US Treasuries. Today at 2.48% the 10 year yield is up 3.55% for the day and up over 20% this year. I would think, that’s where the smart money is going, even though the yields are low. For many, it’s better to receive a small yield, than be in a dangerous stock market.